I just took my first trip to London and I’ll write more about that soon, but the first thing I felt like making when I came home was…Vietnamese-inspired food! Perhaps my palette was overloaded with mashed potatoes and delicious gravies, and I needed the bright fresh flavors of ginger and mint. I have an obsession with Southeast Asian food, and until I take my dream trip to Vietnam, I’ll gratefully settle for my favorite Vietnamese here in the states, like Lan in NYC and Jasmine 26 in Minneapolis. And, of course, whatever I make at home. This time, it’s rice paper rolls. Call them summer rolls, if you prefer! They are the perfect appetizer for any occasion, really. I served these with a rich coconut curry, but they’d be just as at home at a summer BBQ or on their own for lunch. For me, the most important characteristic of a rice paper roll is freshness. Fresh ingredients and fresh wrappers. The rice paper should be supple, and the temperature should be chilly. Inside, there should be crunch and clean flavors. I like to save the spicy assertive notes for the sauce. I love how beautiful my cutting board looks with the simple ingredients for stuffing inside! Here we’ve got my favorite cabbage to eat raw, nappa cabbage. 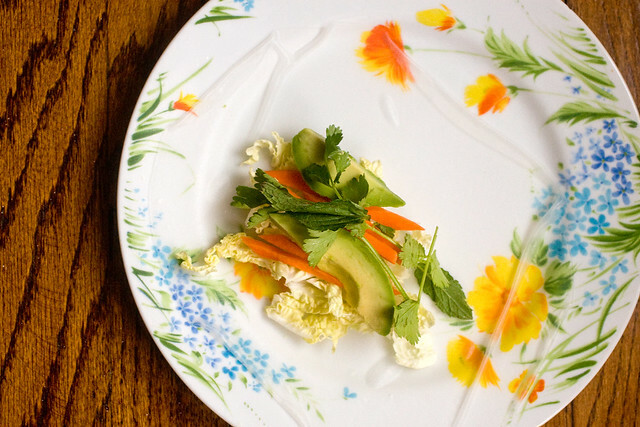 It has a gardeny flavor and the perfect amount of snap; not too difficult to chew. Carrots, cut into matchsticks, for their color and crunchiness. Avocado to add a creamy fattiness that is the perfect foil for all of the veggies. And you can’t have rice paper rolls without fresh herbs! Mint and cilantro make these rolls pop. Since I served these as part of a larger meal, I didn’t feel a need to add tofu, but you totally can, if you like. Baked or sauteed and sliced into strips is ideal. The peanut dipping sauce employs a little cheating ingredient: red curry paste. This way, we don’t have to do any more chopping or cooking, everything goes into a little blender and 30 seconds later a spicy, peanutty, gingery, tangy sauce appears. Magic! Just double check your red curry paste for fishy ingredients. Thai Kitchen paste is widely available and vegan. If you’ve never worked with rice paper wrapper before, don’t be intimidated! Follow my notes below and you can not go wrong. And even if you do, no big deal. There are, like, a million wrappers in a package last time I counted. But really, it’s all about the fun, so grab a friend and get rolling! You’ll be a pro in no time. Now go get fresh. 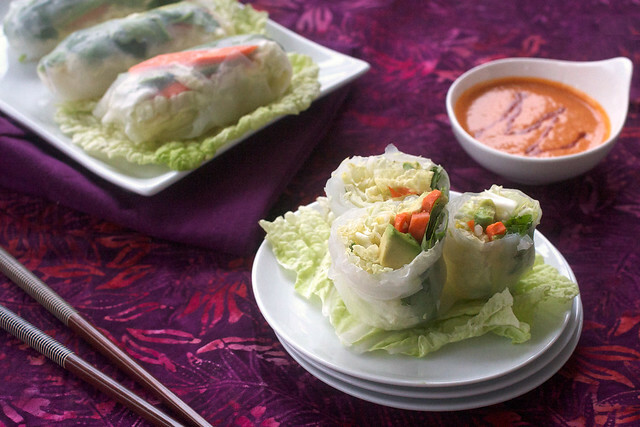 ~ These tips are all going to be for how to keep your rice paper rolls from ripping. But as I said, if one rips, it really doesn’t matter. Either eat it anyway (as a test subject!) or empty out the ingredients and start again. NBD. ~ When adding the wrappers to the warm water, add them one at a time. If you put them all in at once in a pile, they’ll stick together. Do 3 or 4 at a time, adding them into the bowl individually. ~ Keep a clean towel nearby, to wipe your hands and keep them dry. This keeps the slipperiness to a minimum. Also, wipe down your rolling plate every now and again to keep it from being too slippery. ~ Don’t overfill the rolls. I’m including a pic to give you an idea of how much filling to add, but don’t worry, if you’re using too much filling, you’ll figure it out quickly. ~ Avoid having pointy sharp ingredients right at the surface of the wrapper. Carrot sticks and cilantro stems like to poke through the wrapper, so as best you can, try to prevent that. ~ Reserve extra nappa cabbage leaves for serving. The wrappers like to stick to the surface of plates, but they lift easily away from cabbage leaves. First, make the sauce. Just put all of the ingredients into a small blender and blend until smooth. Add a few tablespoons water if needed, to thin. Taste for seasoning and keep sealed until ready to use. OK, now let’s get rolling! Prep all ingredients and lay them out on a cutting board. Drizzle the sliced avocado with lime or lemon juice to prevent browning. Have ready a dinner plate to roll on. Also, have a baking dish lined with moist paper towels, to place the rolls once ready. This will keep them fresh and prevent sticking. Use a large bowl, wide enough to accommodate the rice paper wrappers. Fill the bowl with really really warm water, that is not too hot to handle. You’ll have to refresh the water a few times while rolling, to keep it warm. Add 3 or 4 wrappers to the warm water, one at a time, and dunk them in to submerge. Let steep for a minute or so, until nice and soft. Remove a wrapper from the water. Handle gently and patiently, and spread it out on the plate. It won’t be perfect, but that’s ok, just get it as flat as you can without being too fussy. Now fold the sides over the filling, and roll up the bottom of the roll, tucking it over the filling, and continuing to roll until it’s, well, a roll! Place each roll in the baking dish and cover with damp paper towels to keep fresh. You can even make these a day in advance, wrapping the dish tightly in plastic wrap, until ready to use. Serve with sauce, and if you’d like to be fancy, you can cut them in half and place standing cut-side up on a cabbage roll. Pretty! Wow, Isa, this looks amazing! One question for you: I am on a special diet that restricts sugars (refined as well as things like agave, honey, maple syrup…even bananas! Which is bananas.) Will it ruin the taste completely if I omit the agave? Thank you for another awesome-looking recipe. You’re so talented, it’s crazy. No, it’ll still be good! But I believe that there is sugar in the curry paste and the Sriracha. Try a savory dipping sauce, like sesame oil, rice vinegar & soy sauce, maybe? Or any gingery peanut sauce that doesn’t call for sugar. Thanks for this! I often buy delicious “summer rolls” at WF’s Gengi section and have been wanting to try my hand at making them. With this I’ll be confident enough to try. Looks great! I must find rice paper wrappers! Making this. Thank you!!! Love rice paper rolls. And this is filled with colorful veggies. Yum! I am Vietnamese, and I can say this is at least recognizable. We call them spring rolls in my family, but that may be different for others. 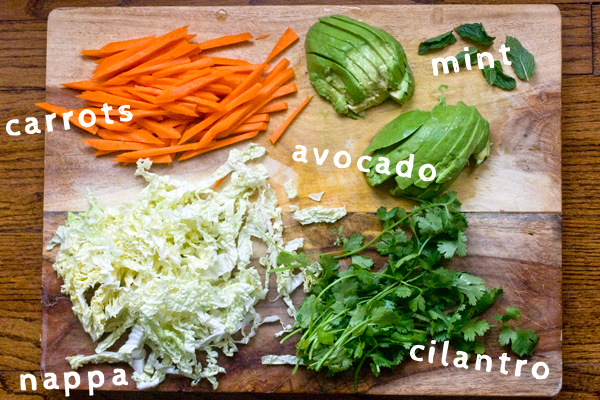 We’ve never used avocado as an ingredient–it might be awesome–but typical fillings are rice noodle, shredded carrot, cucumber, Thai basil or mint, cilantro, lettuce, and some kind of seasoned protein. I usually make sesame-crusted tofu or a more basic marinade of soy sauce and sugar (or other sweetener) for fried tofu or tempeh. -I have never found the hand-drying or wet paper towels necessary. 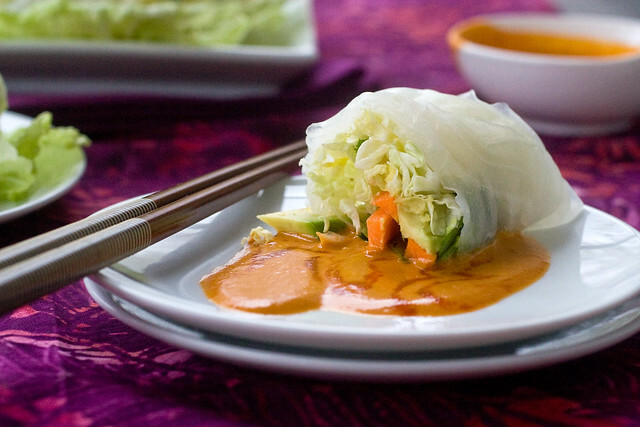 It takes a long time for rice paper to dry out, and even leftover, they’re okay. (I wouldn’t recommend rolling them that far ahead–better to save the filling and roll them fresh so the rice paper keeps its texture). -It’s not super important that the water stays warm. The rice paper will soften more quickly, but there’s no need to refill or change the water just because it cools off. -**NEVER leave the rice paper in the water to soak. ** That’s why it’s so soft, ripping, and folding onto itself when you take it out of the water. It’s much better to submerge the rice paper completely for just a few seconds and allow it to soften on the plate as you add the fillings. If you want to soften a lot at once, use rice paper holders. -tough veggies (like carrots) should be very thin so they can bend easily. If you pick it up and it flops over, it will be much easier to eat and probably won’t poke a hole in the paper. -When you roll it, **roll it tightly. ** Press everything together and tuck the rice paper as you go. This keeps the filling inside the paper when you want to dip it after the first bite. And some people were asking for peanut sauce recipes! I use creamy peanut butter, sweetener, soy sauce, chili paste (preferably the chunky kind), plum sauce, and water. You have to check store-bought plum sauces, since they aren’t always vegan. Top it with crushed peanuts. These look fantastic and I couldnt agree more, a good light viet meal to cleanse the palate! Marinated tofu is a great add if you need a bit of a protein hit. I sometimes just prep a whole lot of stuff and let the family make their own with what they want. I just want to add too… I’m still baking cookies and cupcakes from your books. They’re my ‘go to’ baking books and I love them to pieces (literally – they’re falling apart). Yes, I had plenty of delicious food! I have always wanted to make something like these. I am going to HAVE to try this recipe ASAP. Love the photos! Thank you! I’m trying to work on my photo skilz. That sauce sounds sooo good!! Awesome idea! I understand about potato and gravy overload in the UK, having lived there for 8 years. I realize that might seem an unfair claim (sorry, Brit friends! I love you, and your courageous animal rights activism lead me from vegetarian to vegan, for which I will always be grateful), but I totally get the drift of this post, and the desire for the fresh ingreds in this recipe. The cutting board is never more beautiful than with these ingredients assembled, and ready for action; gorgeous. This is a must recipe for any time, but esp now, with warm weather closing in. Thanks! Christina Waltermyer taught me to always double up on the wraps to avoid tearing; it’s a great tip! I’ve never had a casualty and, since the paper is so thin, it’s still not over-doughy. I have an abundance of rice paper rolls in my pantry that I always seem to forget about, so whenever I see a good rice paper roll recipe I always want to make it. The red curry sauce sounds so so delicious! oooh i love a good spring roll! these look great! These look absolutely incredible. I love peanut based dipping sauces, yum, yum! I admit I have been intimidated to use rice paper, but you have convinced me. I just made these, and they were perfect for a dinner outside. (Isa, your directions on how to manipulate that rice paper were flawless.) The recipe easily made 16+ and I kept them chilling in the fridge, lightly covered with damp paper towels until we were all ready to chow down. The peanut sauce is beautiful and rich next to the light crunchiness of the rolls. My only question is–maybe someone can weigh in here–what other ingredient could I wrap up in there to give the filling more toothsome bite? They are just a little too light for a meal on their own. Or maybe we had had too many mojitos. With or without another something-something, I am definitely making them again next week. These were SO GOOD. Like really, really good. Way less complicated and time consuming than I thought they would be- your directions made it much less intimidating. Making them was actually really fun, especially together while drinking some wine. My husband just kept saying “These are amazing. These are amazing” repeatedly between chowing. Mint+Cilantro= yum. We maaaaay have eaten more than half of the 16 between the two of us. Oh, and the sauce: wow. Thanks so much! These were great! I have tried countless peanut sauce recipes, and this was the simplest and the BEST!!!! Finally! And the wraps worked well – no tearing! These look so good! I loved your curried tofu avocado taco thingy and I want to try this, but I have one question: what is sriracha and where do I find it? This is great. There’s a Vietnamese market near me. I’ve seen the rice paper, but had no idea how to use it. Now I’m going to try these rolls. Ps…have seen your new book is available to pre-order from Amazon. I can’t wait that long! Am busting to know what kind of recipes will be there! 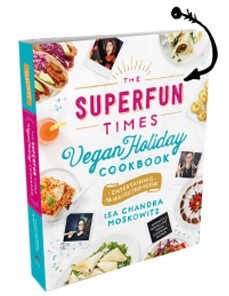 What about another book with scandanavian type things, also France foods as it is ridiculously hard to be vegan over there…we need MORE books cus ur fab! I hope my earlier comment wasn’t taken the wrong way…I made a dessert (not from PPK!) that utilized spring rolls. It was the first time I had worked with them, so the disaster that followed had me questioning if it was faulty technique or characteristic of spring rolls in general. Any idea what made the finished product slimy in texture? Yours in the pic look delicious…mine were refrigerated before serving, but they were still sticky and…well, let’s just say very unappetizing. Any feedback would be appreciated. which curry paste would be the best to use? do you have your favorite brand or favorite recipe? I used Thai Kitchen brand. Good looking stuff, I will have a crack at them tonight! I am currently living in Vietnam, I moved here a month ago, and I have noticed that no body really submerges their rice paper before use. I used to do so which always ended up in a sticky ripping mess. Here people just have a little spray bottle filled with water (due to the climate that’s always lukewarm of course) and just give a couple of sprays before filling the rolls. At my local Ben Xeo we don’t even use water, you just get a freshly washed lettuce leaf that covers the rice paper which provides enough moisture to make the sheets workable. Any how, I am glad to have discovered your website because I’ve got an abundance on fresh produce here and am in need of ideas to explore them all! I can never find rice paper rolls anywhere. What I mean to say is: I can never find rice paper anywhere. I check at chain grocers, local grocers, and health food stores but they’re nowhere to be found! I’ve always found them in the international section or at an Asian market. Where do you live? I made these and they were delicious. I did add slices of baked sesame tofu, and took a shortcut with the dipping sauce – mixed creamy peanut butter with purchased sweet chili sauce – more PB in mine, less in my husband ‘s. We’re hooked! I gave the link to friends so they could also enjoy them. Thanks for the great recipe! in my mouth right now. amazing! Super delicious. I never tried making my own spring rolls before and was so pleased that it actually worked. And the leftover sauce is great for raw carrot dip in lunches the next couple of days! I agree that Jasmine 26 is one the best restaurants in Minneapolis. Next time you find yourself in here, I’d encourage you to try Rice Paper Restaurant in Edina (50th & France). It’s fabulous, and there is a separate vegan menu available upon request. Rice Paper and Jasmine 26 are our two favorite places in town. We’ve gotten to know both of the proprietors in the last few years. They are wonderful people, and we are extremely lucky to have their talents here in the cities. 1) That tip about serving on the cabbage… just made my spring roll life! I always get so frustrated when I make beautiful rolls and they stick to the plate and rip. Now I actually want to serve them to friends and family! Anyway, thanks again for another amazing recipe and the great tips! Thanks, I love making sauces. Glad you like ’em. This recipe is great, I particularly loved the peanut sauce. Thanks for the post. I made this and added Mango. It was sooooo good! Homemade spring rolls are the bomb! I was lazy and turned this into a salad. Yum! The dipping sauce made an awesome dressing! I added some leftover quinoa and broccoli to bulk it up a bit. This is amazing. 🙂 Thanks!! The sauce was awesome! The rolls weren’t bad either… (though nothing beats the mango spring rolls in VwaV). Isa, these were delicious!! I made them for dinner tonight, and they were a big hit. Thank you so much for sharing your delicious meals. We have “Appetite for Reduction”, and have enjoyed every meal that I’ve made out of it. You are the best! I love that the dipping sauce looks like the right amount for just one or two portions. It’s hard cooking for one! I just got some thai basil at the farmers’ market so I’m going to throw that in. Thanks! Sorry, but you are going to have to move to a new city! I just recently had spring rolls with avocado. The ingredients were similar to this! Soooo yummy- I am going to make these, and thank you so much for the recipe!!! Made these for a tasting party last weekend and they were fantastic! The freshness of the rice paper rolls and the pure amazing-ness of the sauce made for the perfect combination. Rolling was surprisingly a piece of cake, thanks to your instructions. As per another reviewer, I did not immerse the rice paper wrapper in water. I simply rinsed one quickly under running water. By the time I got it to a plate (lined with a damp paper towel), it had softened up just enough to work with, but not totally limp. Can’t wait to make these again! Another winner–thanks Isa! then possibly the subsequent step for you is one of several extreme weight loss boot camps. during the paces. . . I think that this recipe with a help of which we study how to cope with some rice paper material! I think that studying how to cook is so useful as study how to write with a help of the site https://uk.papersowl.com/research-proposal-writing-service that verify students papers and also proposes students buy research proposal writing service!